There seem to be two classes of people in the world of music: those who praise Ashkenazy uncritically simply because he is the great Ashkenazy, and those who pan him critically for the very same reason. I own quite a few recordings of Ashkenazy the pianist and Ashkenazy the conductor. He is never bad, always reliable, but can be sometimes rather matter-of-fact. Sometimes that sharp edge of high inspiration is somehow missing, even when the performances are quite satisfying technically and artistically. 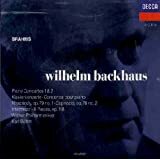 The attraction of this recording for me was the 1st Piano Concerto. Having quite a few already of the 2nd, I wished to expand my collection of the 1st, while adding yet another 2nd (one cannot have too many!). There are in my judgment not many adequate recordings of Brahm's 1st Piano Concerto. Most pianists and conductors cannot seem to paint well with the dark, even drab colors that Brahms provides in this work; nor do they really capture its deep passion and angst. Ashkenazy and Haitink succeed brilliantly where most others fail. Here we have a dark but clear, emotional portrait. Ashkenazy beautifully voices those thick, dark chords and sustains the big line of the music. This is far and away the finest recording of the 1st that I know. Ah, just listen to the magic he works in the 2nd movement! The only thing that mars this performance in the least is one moment in the 1st movement where an out-of-tune horn clashes with the piano. I wonder why they didn't fix that. With recordings of the 2nd, the competition is stiffer; there are numerous worthy efforts. This is my very favorite piece of music, so the performance has to be pretty bad for me to hate it. I have many I enjoy and a few I love, notably, Richter's "romantic" version and the straightforward, "classical" rendition of Backhaus. I expected to be satisfied with Ashkenazy's always-reliable playing, his solid musicianship, his beautiful sonorities. Instead I was blown away! This is one of those times when the pianist is really one with the music, when he drinks deeply of it and lets it have its way. He lets forth with all the pathos, humor, drama, and tenderness that this work means to offer the listener. In both concertos, everything is enhanced mightily by the uncanny rapport between Ashkenazy and Haitink. The conductor appreciates both these works for what they really are: symphonies with piano obligato. He does not merely accompany the soloist, but interacts with him. Whether the orchestral force is the Concertgegouw (in the 1st) or the Vienna Philharmonic (in the 2nd), pianist and orchestra seem to be one unit working together, rather than opposing forces fighting each other. Such is required in this music. The whole effort is greatly aided by the excellent sonics. The concertos were recorded in the early '80s, the orchestral works some ten years later, all in digital sound. You won't find much better sound quality today, and a whole lot worse. I fell in love with the Brahms 1st years ago when I saw the movie, "The L-Shaped Room". It was a French film starring Leslie Caron and this Concerto was all through the movie. I bought the LP shortly after that. 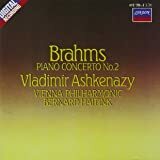 I also purchased Brahms 2nd. These were with Rudolph Serkin with George Szell and the Cleveland Orchestra. I wore out those 2 LPs - still have them and they play well enough on my turntable. While Ashkenazy is very good, I still prefer Serkin and always will. But this is a very well-engineered CD and very pleasing to listen to. Brahms composed two of the finest piano concertos of the 19th Century. The first, in D-minor, was composed when Brahms was in his early twenties and a long-term guest at the home of Robert and Clara Schumann, where he witnessed the mental breakdown and death of Robert, very likely fell in love with Clara (14 years older than himself), and then realized that he would have to leave and set out on his own. The concerto, which started out as a symphony, reflects the emotional turmoil that Brahms went through at this time. The first movement opens with a drum roll and blends a dramatic passage that verges on hysteria with a consoling second thematic group. The second movement, one of Brahms' loveliest creations, is a love song to Clara, as Brahms himself noted. The final movement is a sonata-rondo with a fugal development section. The first movement was adapted from the aborted symphony (whose second movement was later used as part of the second movement of Brahms' German Requiem), and the other two movements were added later. Brahms performed the concerto in Leipzig in 1859, where it was not well received, but it eventually became a staple of Clara Schumann's many concerts throughout Europe. Brahms completed his second piano concerto more than 20 years later, when he was at the height of his musical powers. It consists of four movements, the second being a tempestuous scherzo. Except for this movement, allegro appassionato in D-minor, the concerto is in the sunny key of B-flat. The first movement opens with the main theme played by a horn, followed by a cadenza on the piano --- the only one in the work. The third movement, andante, features an extended solo cello theme, with the pianist entering for the more dramatic middle section and later embellishing the return of the cello theme. The last movement, allegretto graziano, is in sonata form and has Hungarian touches. This wonderful concerto is a "desert island" choice of many. 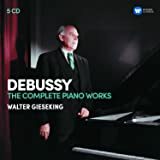 The featured pianist, Vladimir Ashkenazy, gives fine performances of both these concertos, but I think he's better in the first than in the second. The conductor in both cases is Bernard Haitink, with his own Concertgebouw Orchestra for the first but with the Vienna Philharmonic for the second. Ashkenazy's performance of the first emphasizes the pain-laden emotion of the opening movement and is better than the more sedate performance by Claudio Arrau with the same conductor and orchestra, and Ashkenazy's playing of the second movement adagio is gorgeous. On the other hand, his (or Haitink's) choice of tempo for the scherzo of the second concerto seems too slow and becomes a bit plodding, and the third movement is almost an adagio instead of the indicated andante. The Vienna Philharmonic is a little tame in some of the fortissimo passages as well. Even so, Ashkenazy's performance is a very good one. Also included on the two-CD set are "Variations and Fugue on a Theme by Handel" that Brahms wrote for piano solo and dedicated to Clara, and "Variations on a Theme by Haydn," originally composed for piano duet but later orchestrated by Brahms and more familiar in that form. It's now known that the theme, sometimes called St. Anthony's Chorale, was not Haydn's, but the real author is unknown. The theme is followed by 8 variations and a finale, and the orchestrated version is brilliantly scored. The Handel variations are based on a theme from Handel's Harpsichord Suite No. 1, and the concluding fugue uses a modified version of that theme. It's a difficult but splendid piano work, but here it has been orchestrated by British composer Edmund Rubbra in the stylistic manner of the Haydn variations, although some of the 25 variations sound more like Elgar than Brahms. The individual lines of the concluding fugue, difficult to render on a piano, benefit from being played by orchestral instruments. Ashkenazy puts on his conducting hat and leads the the Cleveland Orchestra in lively and well-balanced performances of both sets of variations. For orchestral sound, the Cleveland seems better in these recordings than either the Concertgebouw or the Vienna Philharmonic, though they are both quite good. The recordings were made in the 1980's and the early 1990's. One thing that I noticed: in the Brahms Second, the highest piano notes sound like little bells, especially in the last movement. That doesn't occur in the Brahms First. In summary, I'd give the Brahms Second four stars and the rest five. 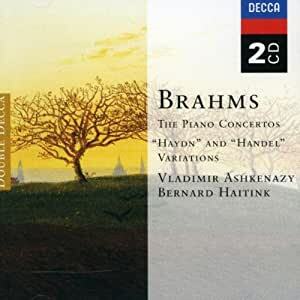 There's a lot of very fine music here at a bargain price, so this 2-CD set is well worth adding to your Brahms collection.